Appearance: She appears to have more of a really light lavender coat, with violet hair, and a gradient of normal pink to the lightest pink highlights. Her mane has a split at the ends, with the highlights nearby. Her bangs cover the ends of her horns. She also has blue eyes, and a star with swirls cutie mark. CM Story: Silver was a little girl, always dreaming of meeting Princess Luna before she was sent out to the moon. When she heard that she was sent there, she cried, and cried. Until one moment, Silver's eyes turning bright blue, when it turned completely white, and at the moment, she was flying! She flew she used her magic to make one of the stars fall as she cried, making the first shooting star! The shooting star shot itself near a bunch of other stars, creating the first constellation! 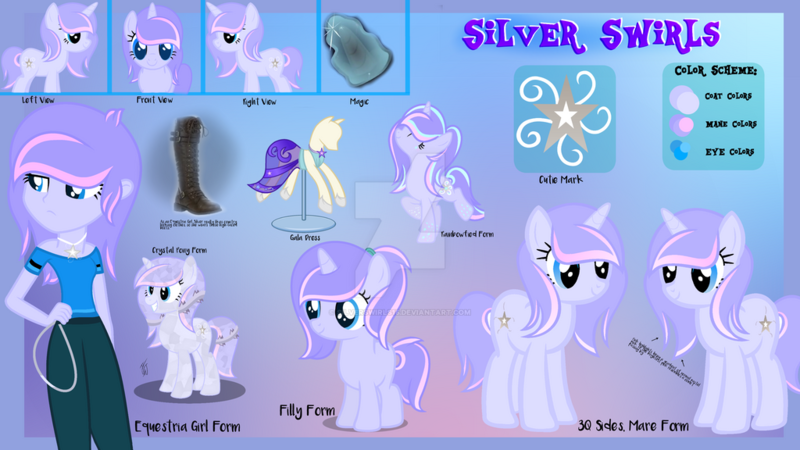 When she landed, she got her cutie mark, a silver star with swirls representing the movement of how the stars reacted. Silver has created the first constellation and shooting stars. Relationships: Friends with basically everyone in Ponyville, Iris Blossom (childhood friend), and family. EQG: Short hair, with a necklace, resembling her cutie mark, short blue t-shirt, and short jeans with high top laced boots. Her chain around the waist is a gift from generations before her giving her good luck, and is never taken off during school. Would i be aloud to design that for you? Super job. Only asking do she wear long skirts. It's been awhile sense we've talked, and I've really missed you!